John Griffith, founder of GriffithLaw, first met with Tom and Chad at a Great Legal Marketing Summit, on the recommendation of Ben Glass. “We clicked right away,” John says. He walked away from that meeting impressed by Foster Web Marketing’s professionalism and genuine interest in his needs and concerns, and he ultimately chose us to build a new website and provide marketing services for his firm at that time, Griffith & Roberts. 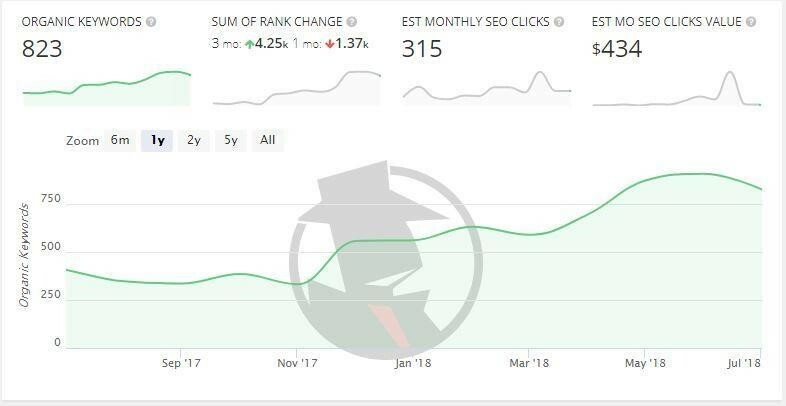 That site launched in January of 2016 and John remembers seeing an increase in traffic right away. He and Digital Marketing Strategist Cody Moulton put their heads together to develop a long-term plan for building on that success with content and videos, which John already had in the works. Everything seemed to be going great, but an unexpected change was on the horizon. Just as he and Cody really got to work, John made the decision to leave his partnership in downtown Nashville and move his office closer to home in Franklin, Tennessee. This meant that, just five months after his initial website launch, John needed a new plan. John quickly established his own firm, and we strategized a complete digital rebranding to promote his new firm and location. GriffithLaw’s new firm name, office address, and phone number went live with his website’s domain change on June 1, 2016. SEO. We looked at what kinds of clients John wanted to attract, then researched and implemented the best strategies for getting their attention online. Local citations and legal directories. We helped John update, sync, and leverage his listings and profiles across the Web. Domain authority. Changing the domain name for his website meant that John had to build online trust and authority all over again. We helped John build and optimize an authoritative website while maintaining his good standing with Google and other search engines. Content optimization. We reviewed and optimized all the content on John’s site and added new library and FAQ content to bring in more searchers. Reputation management. We coached John and his team through methods for improving the firm’s reputation and generating positive reviews. Website design updates. 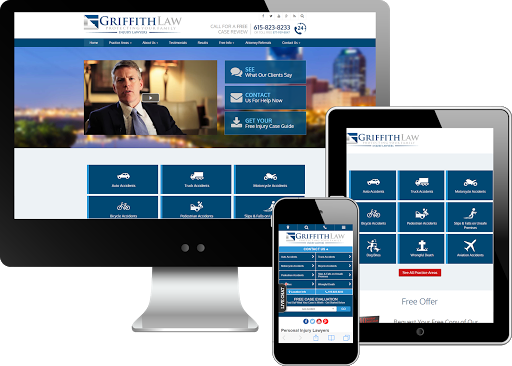 We updated the homepage, the office page, the mobile site, his testimonials, and more to better showcase the new firm and what GriffithLaw has to offer. AdWords management. We worked with John to come up with a PPC strategy that targeted the right audiences and made the most of the resources he put into it. John and his team also started blogging, sending out email and print newsletters, getting involved in social media, running aggressive referral campaigns, and generating killer reviews from happy clients. We love working with John Griffith and his firm, and we love seeing them build on success after success. Since the initial launch and rebranding, we’ve done a ton of projects to improve site engagement and performance, and we maintain ongoing efforts to keep boosting them to the next level. They are a perfect client for us, and the phenomenal service they provide to their clients is easy to see in the testimonials and client reviews they continue to receive. Overall, these numbers mean that GriffithLaw has more visibility, increased traffic, and improved leads, which in turn leads to an increase in the most important KPI, the number and quality of cases. And that growth continues today. The growth of GriffithLaw has been impressive, and you don’t need to see the hard numbers to sense the change. John has had so many new clients walk through his door that he had to hire new people to keep up with the ever-expanding caseload. “Our biggest source of new cases we accept comes directly from our web presence via Foster Web Marketing,” he says. John also hired Sydney Raines in February of 2018 to help with marketing and reception, and she now manages a lot of GriffithLaw’s marketing. It’s a move that, in our experience, seems to be an important part of becoming a bigger firm, and it was a decision that relieved John from many marketing tasks. Along with the increased number of clients and cases, John also recently won the Tennessee Trial Lawyers Association's 2018 Outstanding Trial Lawyer of the Year Award, which demonstrates his actual success over the past two years—the kind that is hard to quantify. “I chose FWM because I was searching for answers as to why my old website was not producing any results. I was wasting time and money on a website that looked good to me but apparently not to my ideal client. While there always are some “quick wins” we can put into motion for our clients, we believe in proven methods that take time to gain momentum. John’s story is a great example of how that hard work can and will pay off over time. We didn’t see huge spikes in leads or traffic overnight, which some clients expect when they implement new strategies. Instead, John’s success was slow, steady, and trackable. Is it time to reinvent your law firm? Are you struggling to bring in new clients after a move or major change? Reach out to our team at 888.886.0939 or sign up for a website analysis, and let’s start strategizing for the future.